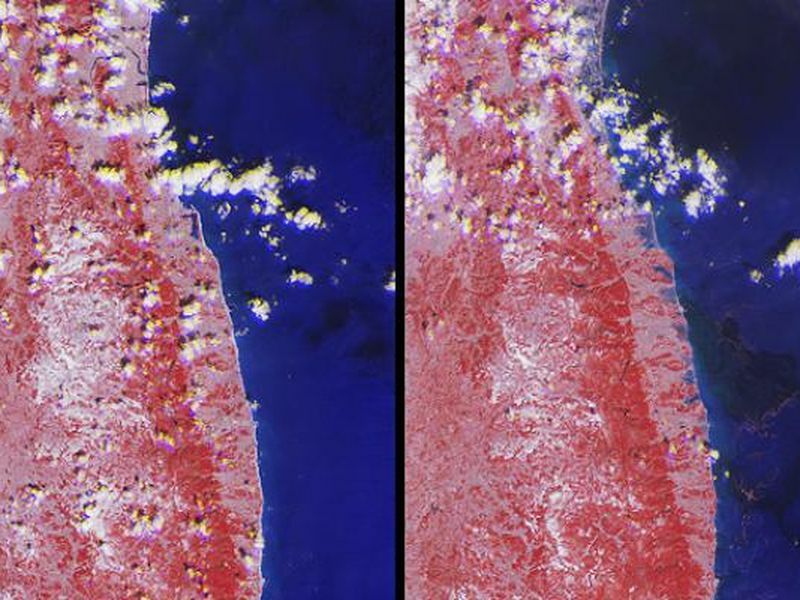 The extent of inundation from the destructive and deadly tsunami triggered by the March 11, 2011, magnitude 8.9 earthquake centered off Japan's northeastern coast about 130 kilometers (82 miles) east of the city of Sendai is revealed in this image pair from the Multi-angle Imaging SpectroRadiometer (MISR) instrument on NASA's Terra spacecraft. The new image, shown on the right, was acquired at 10:30 a.m. local time (01:30 UTC) on March 12, 2011 during Terra orbit 59731. For comparison, a MISR image from March 16, 2001, acquired under nearly identical illumination conditions during Terra orbit 6607, is shown on the left. 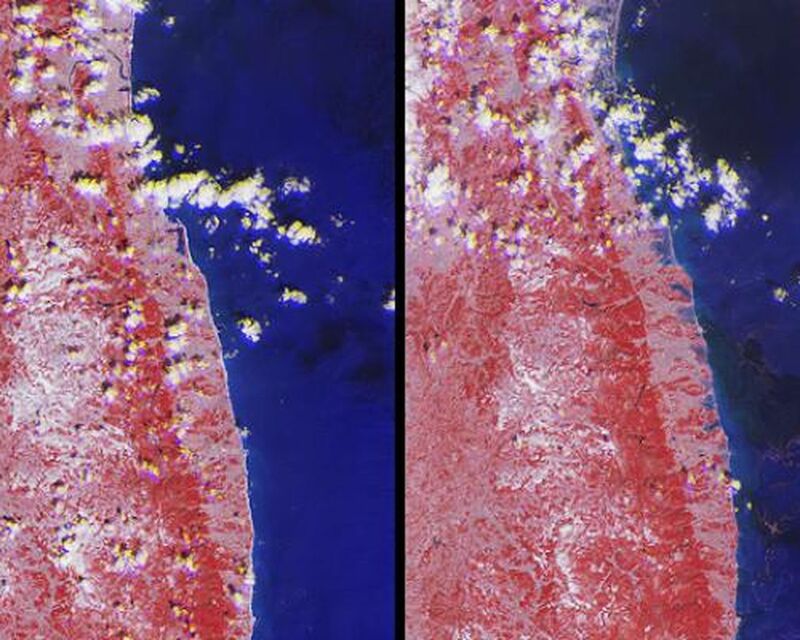 From top to bottom, each image extends from just north of the Abukuma River (which is about 21 kilometers, or 13 miles, south of Sendai) to south of the town of Minamisoma (population 71,000, located in Japan's Fukushima Prefecture about 70 kilometers, or 44 miles, south of Sendai), and covers an area of 78 kilometers (48 miles) by 104 kilometers (65 miles). 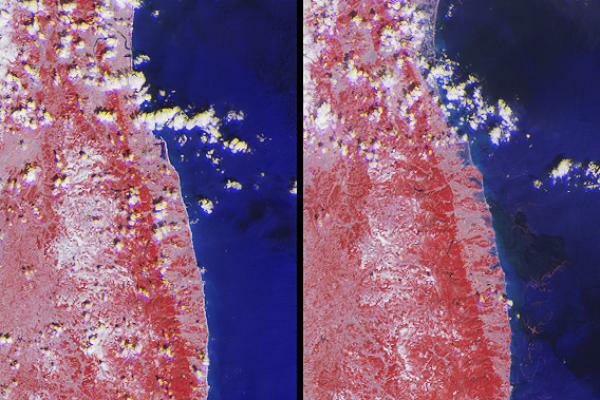 Flooding extending more than 4 kilometers (2.5 miles) inland from the eastern shoreline is visible in the post-earthquake image. The white sand beaches visible in the pre-earthquake view are now covered by water and can no longer be seen. Among the locations where severe flooding is visible is the area around Matsukawa-ura Bay, located just north and east of the image center. These unique images enhance the presence of water in two ways. 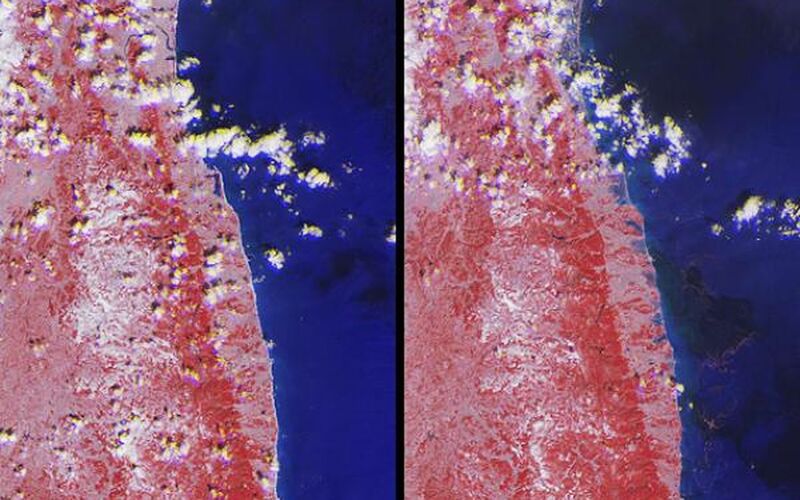 First, their near-infrared observations cause vegetated areas to appear red, which contrasts strongly with water. Second, by combining nadir (vertical-viewing) imagery with observations acquired at a view angle of 26 degrees, reflected sunglint enhances the brightness of water, which is shown in shades of blue. This use of observations at different view angles causes a stereoscopic effect, where elevated clouds have a yellow tinge at their top edges and blue tinge at their bottom edges.